March on Washington Film Festival closing night film and panel, Smithsonian National Center of American History, July 22, 2017. Panelists: Former Mayor of Charlotte, North Carolina Anthony Foxx; former Mayor of Gary, Indiana Richard Hatcher; and former Mayor of Tuskegee, Alabama Johnny Ford. Opening remarks by Washington DC Mayor Muriel Bowser. Los Angeles City Hall, February 2, 2016. Pasadena City College history professor and key academic advisor for the film, Christopher Jimenez y West; Lorraine Bradley; Alison Sotomayor; Lyn Goldfarb; Los Angeles City Councilman Marqueece-Harris Dawson; and former Los Angeles City Councilman Robert C. Farrell (ret.). Los Angeles Trade Technical College dedication of the new Tom Bradley Center, December 12, 2017. 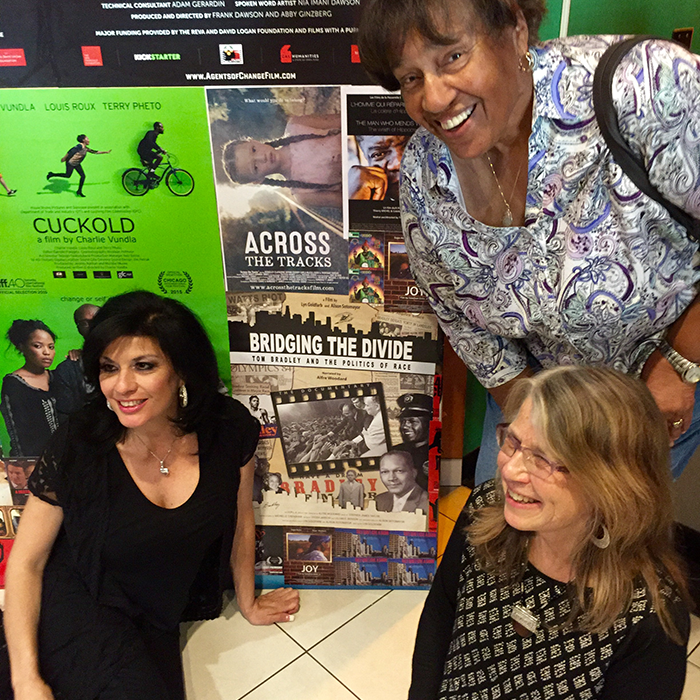 Alison Sotomayor and Lyn Goldfarb at the permanent Bridging the Divide exhibit. Pan African Film Festival, February 6, 2016. Lorraine Bradley, Lyn Goldfarb, composer Stephen James Taylor, audience member, Alison Sotomayor, and graphics designer Randy Kubaszak. Pan African Film Festival, February 6, 2016. Alison Sotomayor, Lyn Goldfarb and Lorraine Bradley. Pan African Film Festival, February 6, 2016. SPUR/Oakland screening, February 9, 2016. ITVS Content Development & Initiative Manager N'jeri Eaton; Alison Sotomayor; Lorraine Bradley; Lyn Goldfarb; California Humanities board member and San Francisco public defender John Adachi; and Senior Fellow of Policy Link Joe Brook. LA City Club, March 3, 2016. Lyn Goldfarb, Alison Sotomayor, former Los Angeles City Councilman David Cunningham Jr., and Phyllis Bradley. LA City Club, March 3, 2016. Congressional Black Caucus, April 14, 2016. 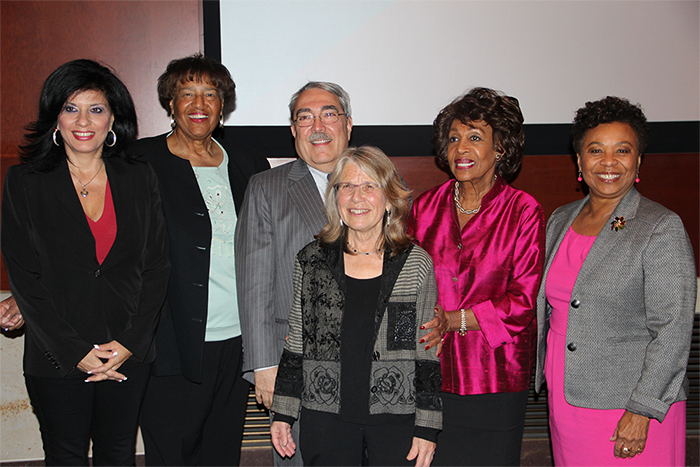 NBPC Executive Director Leslie Fields-Cruz; Lorraine Bradley; Congressmember Barbara Lee; Congressional Black Caucus Chairman G.K. Butterfield; Lyn Goldfarb; Alison Sotomayor; NEH Chairman William Adams; and Editor of The American Prospect Harold Meyerson. Los Angeles Film Festival World Premiere, June 14, 2015. Graphics designer Randy Kubaszak, researcher Toni Bell, Alison Sotomayor, production manager Patricia Cunliffe, Lyn Goldfarb, composer Stephen James Taylor, and editor Stosh Jarecki. 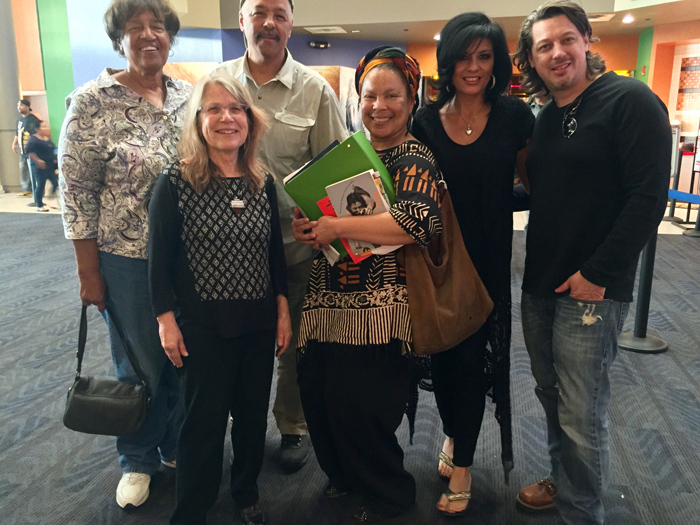 Jackie Robinson Arts & Humanities Lecture Series, October 15, 2015. Christopher Jimenez y West, Pasadena City College history professor and key academic advisor to the film; Alberto Juarez, Pasadena City College adjunct professor of Chicano/a Studies & Political Science; Alison Sotomayor; Lyn Goldfarb; Raphael Sonenshein, Executive Director of the Pat Brown Institute for Public Affairs, CSULA and key academic advisor to the film.